Smartphones and tablet computers render possible new approaches to monitor and train patients over long time-periods with minimal interference with the patients' daily life. We developed a method enabling physicians and psychologists to create interactive dialogs for mobile Android-based devices for data capturing, monitoring, and patient training. The dialogs are created using an easy to understand internet web-site. After web-based synchronization with the mobile device, the dialog may be run by the patient or the study subject as often as required. The entered data is transmitted in real-time after a dialog has been answered. The responsible specialist is notified if cognitive abilities do not match a range of desired values and may take appropriate actions. This could either be adaption of the level of difficulty for the neurological tests or contacting the patient or his/her family doctor concerning therapeutic interventions. may be used to follow different routes through the dialog. These modules allow to determine the short term memory, the ability to focus, and the reaction time of the patients. Application scenarios of TIKANIS Telemedical Training range from clinical studies to the out-patient treatment. In the neurological out-patient deparment of the University Hospital Freiburg, Germany, patients fill out standardized questionaries like the Seizure Severity Scale or ABNAS-2 while sitting in the waiting room. Afterwards, the results are displayed on the doctor's computer screen and support the anamnesis process. The monitoring units have been used to evaluate behavioral side effects of antiepileptic drugs  and to prospectively determine whether epilepsy patients are able to predict upcoming seizures based on prodromal events . L. Frings, K. Wagner, T. Maiwald, A. Carius, A. Schinkel, C. Lehmann, A. Schulze-Bonhage, Early detection of behavioral side effects of antiepileptic treatment using handheld computers, Epilepsy & Behavior 2008, 13(2):402-6. T. Maiwald, J. Blumberg, J. Timmer, A. Schulze-Bonhage, Are prodromes preictal events? A prospective PDA-based study. Epilepsy & Behavior 2011, 21(2):184-8. Creation of the dialogs and linking to Android devices is applied using a web-browser. The Android devices are registered through their unique IMEI number. The web-server is hosted either by TIKANIS or the customer. 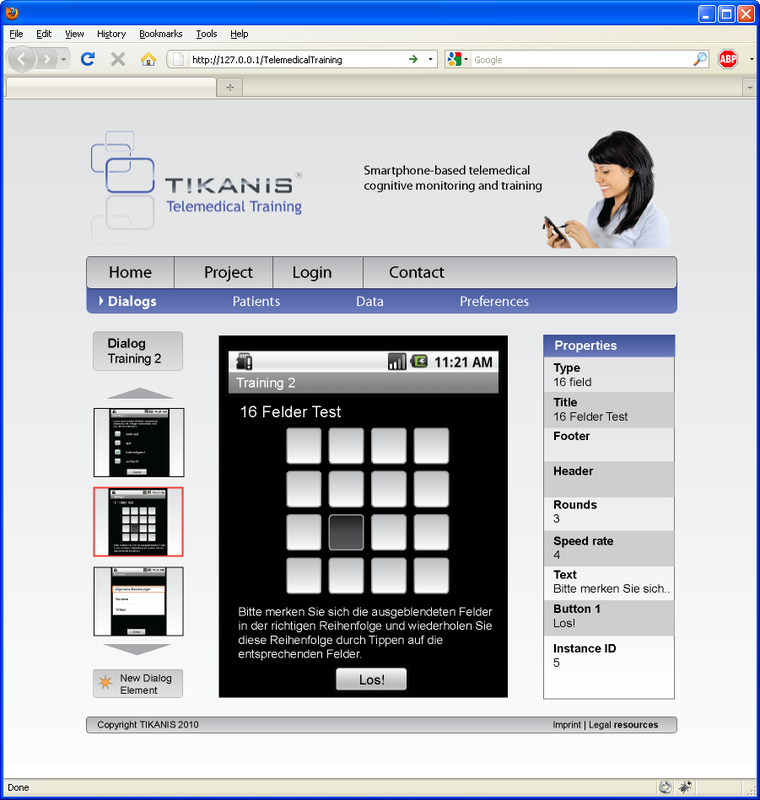 TIKANIS Telemedical Training is installed on the mobile devices which are then synchronized with the web-server. After each completed questionaire or during the next data synchronization, the data is sent to the server and the results can be investigated immediately by the physician or psychologist through a web-browser. 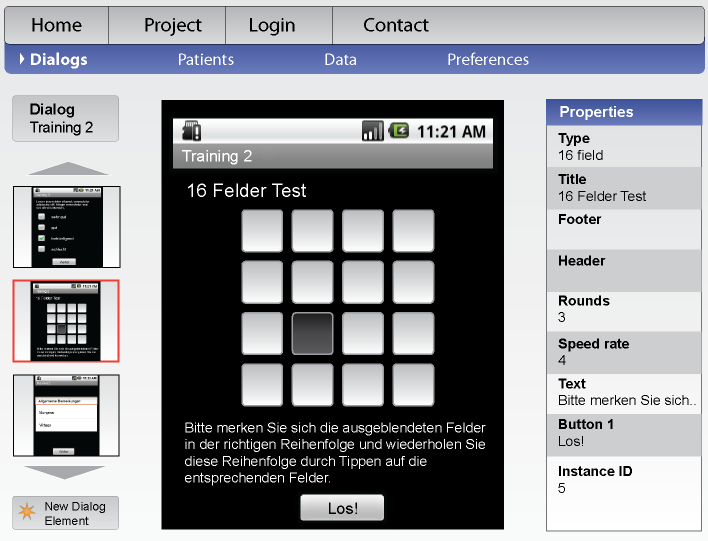 During the study, new or altered dialogs including new parametrizations may be assigned to individual patients, e.g. in order to adapt the degree of difficulty of the neuropsychological tests according to the measured mental fitness of the specific patient. Please contact us if you would like to apply TIKANIS Telemedical Training.